Abstract: The CeBIT 2016 entering its final leg has witnessed the born of a host of advanced products. Airwheel is a noted brand of electric self-balancing scooter. There are millions of customers all over the world. It is no surprising that Airwheel has rolled out four series of six brand new models, as it is also celebrated for its high productivity. 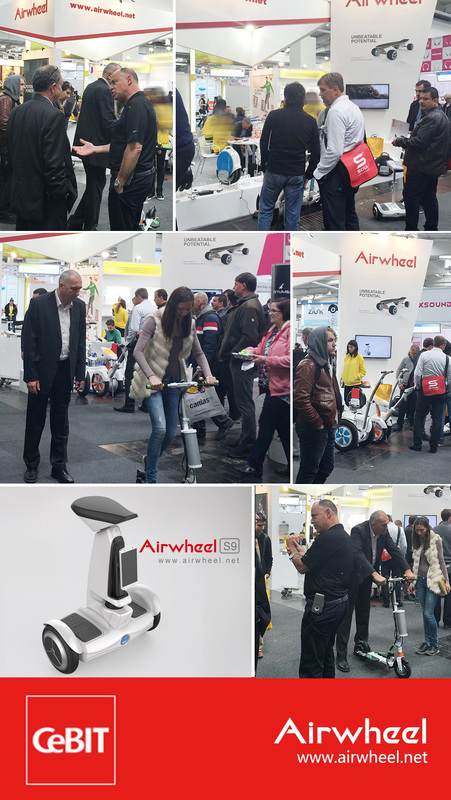 It is worth mentioning that Airwheel S9 wheeled robot caused a sensation at CeBIT 2016. CeBIT was traditionally the computing part of the Hanover Fair, a big industry trade show held every year. The CeBIT 2016 entering its final leg has witnessed the born of a host of advanced products. Airwheel is a noted brand of electric self-balancing scooter. There are millions of customers all over the world. It is no surprising that Airwheel has rolled out four series of six brand new models, as it is also celebrated for its high productivity. Since its foundation, Airwheel Technology shoulders the responsibility of letting the public benefit from the advanced science and technology. Gradually, Airwheel has established market centred and user oriented business philosophy. With the popularity of robot, Airwheel spares no effort to increase input in investment of research and talent introduction. The emergence of Airwheel S9 service robot on CeBIT 2016 heralds that Airwheel has entered the new field and it is on track of artificial intelligence. This goes to say that Airwheel has one eye on other field and has sufficient power to convert R & D to application. Airwheel S9 two wheeled self-balancing robot has realized such functions as obstacle avoiding, trajectory tracking and moving object tracking, etc. This new products announcement surely attract over thousands of visitor to Airwheel booth of CeBIT. This roll-out inspires a deep thought of visitors and players. Indeed, Airwheel S9 wheeled robot caused a sensation at CeBIT 2016 which is an evidence of Airwheel’s potential R&D ability.